Did Microsoft indirectly pull the plug on popular Leak site Buildfeed? Thomas Hounsell was the man behind “Buildfeed”, a popular online leak site. 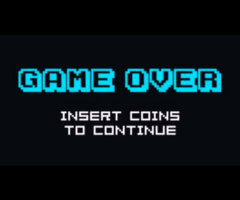 After five years of running the website he has heavy-heartedly decided to go offline. Buildfeed.net was renowned for being quick to release consistent and extremely accurate leaked information on the latest Windows 10 Builds. However, according to outsiders the most recent inside scoop they released may have been the proverbial noose around Buildfeed’s neck. Surely a disappointing development for the website’s large fan base, which utilized the website in order to keep themselves up to speed with the latest builds, long before the official information had even been made available to read in the Windows insider program. 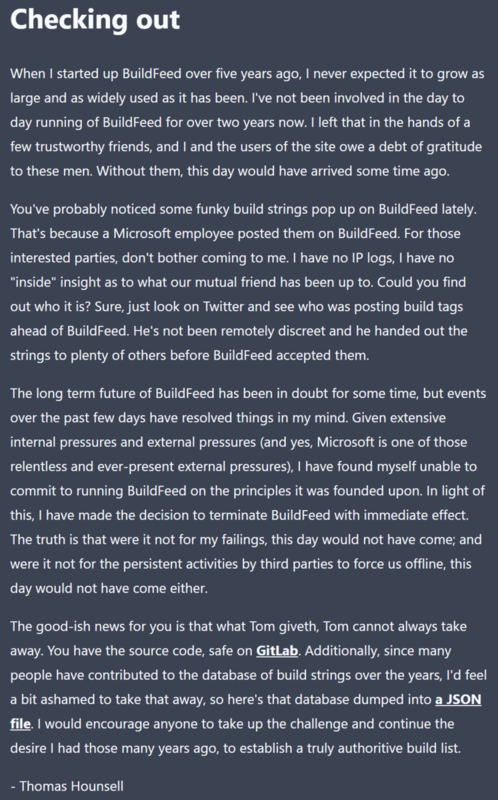 It is most likely that this information derived from Microsoft employees who anonymously released the information on Buildfeed; information that has now been removed and replaced by Thomas Hounsell’s farewell statement. 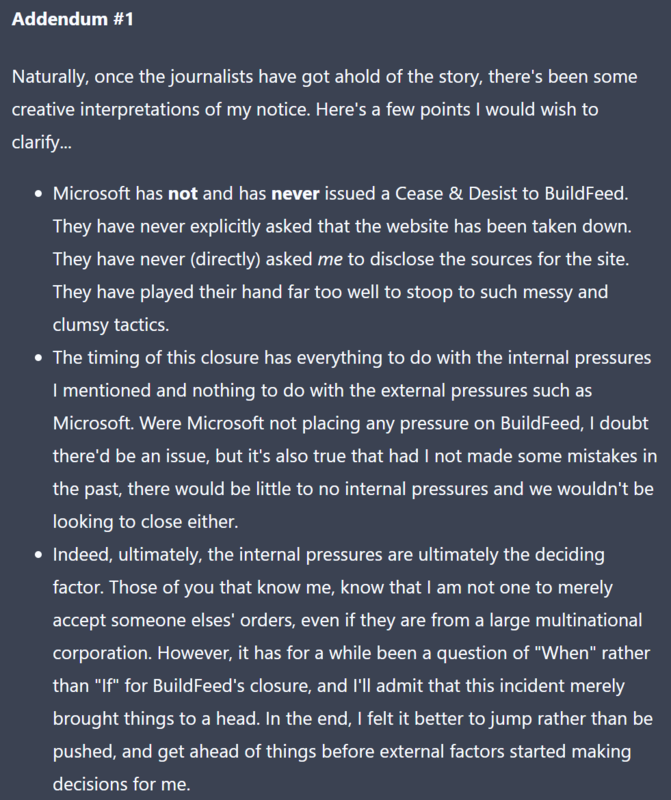 Given extensive internal pressures and external pressures (and yes, Microsoft is one of those relentless and ever present external pressures), I have found myself unable to commit to running Buildfeed on the principles it was founded upon. 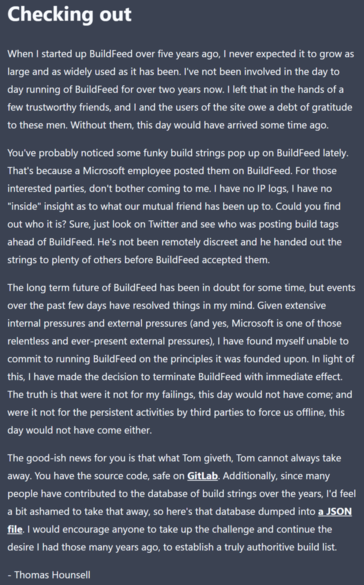 As stated by Hounsell, the pressure exerted by Microsoft on Buildfeed led to his decision to shut down the website. In spite of this declaration, Hounsell seems to backpedal as the statement continues, referring to “internal” pressures instead. 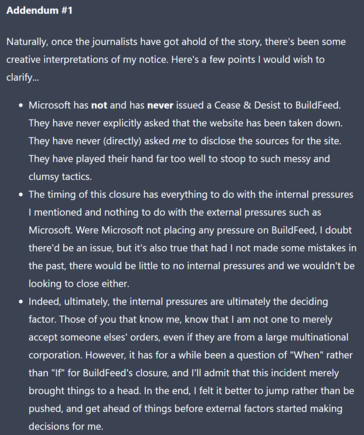 Microsoft has not and has never issued a Cease and Desist to Buildfeed. They have never explicitly asked that the website has been taken down. They have never (directly) asked me to disclose the sources for the site. The timing of this closure has everything to do with the internal pressures I mentioned and nothing to do with the external pressures such as Microsoft. Hereby he emphasizes that Microsoft has and have never demanded him to shut down or stop running his website. However, it seems that Microsoft was interested in acquiring the identities of the individuals acting as informants and releasing the inside information to Buildfeed. Hounsell claims that he could not forward the informants’ IP-Logs to Microsoft as he does not know or have them. What is known is that a leak about the latest 19H1-Update was published yesterday on Buildfeed marked with the string “rs_shell_devices_foldables.190111-1800”. This is the first direct clue that Microsoft is preparing for foldable devices although test hardware is still needed. Unfortunately this information leak seems to have been Buildfeed’s last. > Notebook / Laptop Reviews and News > News > News Archive > Newsarchive 2019 01 > Did Microsoft indirectly pull the plug on popular Leak site Buildfeed?